Don’t think I’m not paying attention to you, blogging friends. 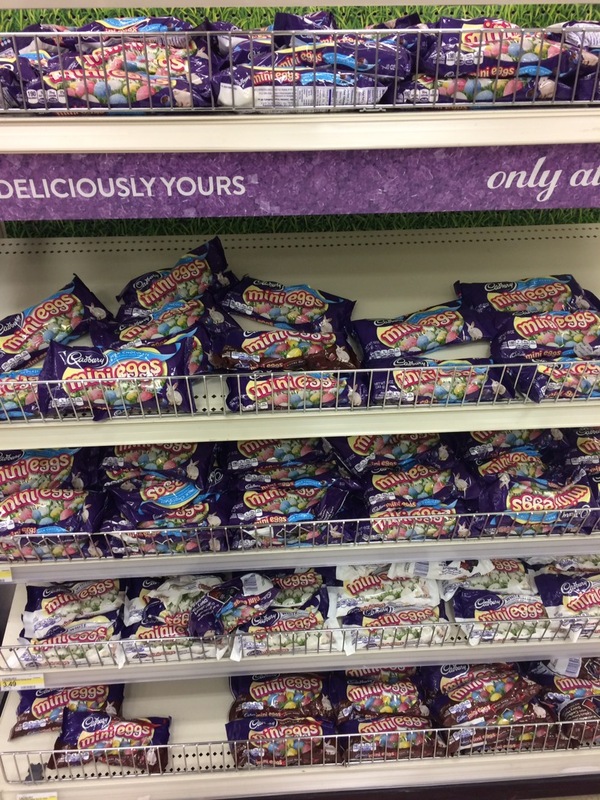 Don’t think that I don’t walk the aisles of Target thinking about you and your blog posts about your childhood dreams and your strange obsessions, because I do. I think about you all the time. @whereshappy, You remember your post about the Barbie head? I commented on it, because like you, I never got the disembodied Barbie head as a child. I confessed that I can also can’t do hair now, and shared my deep dark secret that my mother dared to buy my daughter the toy she wouldn’t buy me. Maybe that just seemed like a normal comment to you, an innocent exchange, but it wasn’t. 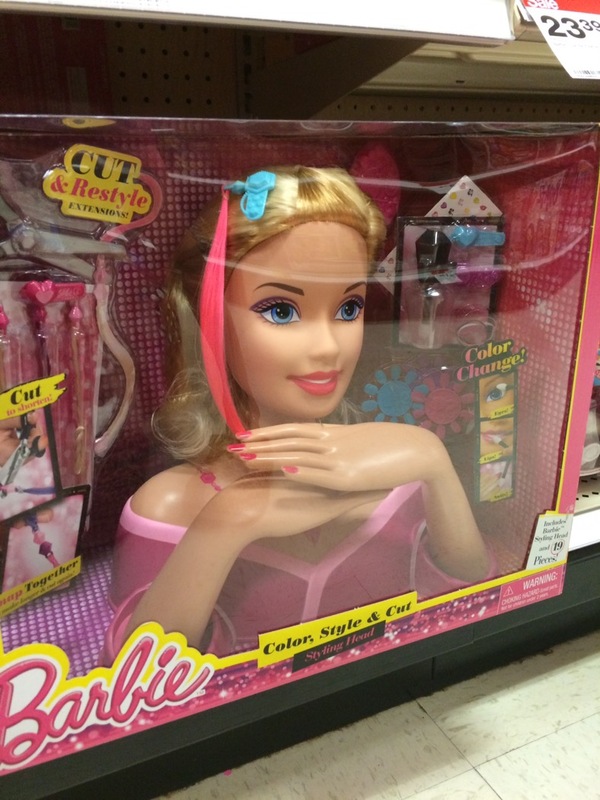 Months later when I was at Target I saw this doll, complete with “Cut & Restyle EXTENSIONS!” and hands with fingernails and I took a picture just for you, so that you would know I was thinking about you. I didn’t send it to you, but I took the picture…just…for…you. It’s beginning to look a lot like springtime! Nice pictures and good memory! Thanks! I’m afraid I’ll be featured on some blogging CSI show if one of these two ladies shows up missing. Good memory verging on creeper. I love having you as a blog friend! Thanks for the compliments and for entertaining me on at least a weekly basis. More mini eggs for me is a total win! You deserve the compliments and thanks for your interesting and humorous posts. I confess–I do this too (think of blogger friends when I’m out and about and something triggers a memory). Maybe we need some kind of stalker support group? “Today, while at the yarn store, I tried to figure out what yarn I would buy to make horrible striped knit pants.” Tee hee. That would be Noro Silk Garden! Oh man, that is so funny! Can you believe that I’m 43 and I STILL want one? I think I’m just going to have to break down and get that damned Barbie head–better late than never? I just think that I would be passing some invisible line of weirdness that I will never, ever be able to get over if I do! Thank you for the picture! I can’t believe you still remember that! How could I forget? Those are the ties that bind blog relationships. The pain of no Barbie is a wound that cuts deep! We should start a support group. I’m sure there are more of us out there with air dried hair that is never braided because Barbie never taught us how! Reblogged this on a funny thing happened when I was learning myself.